This actually isn’t the first diaper cake tutorial I’ve shared on the blog. 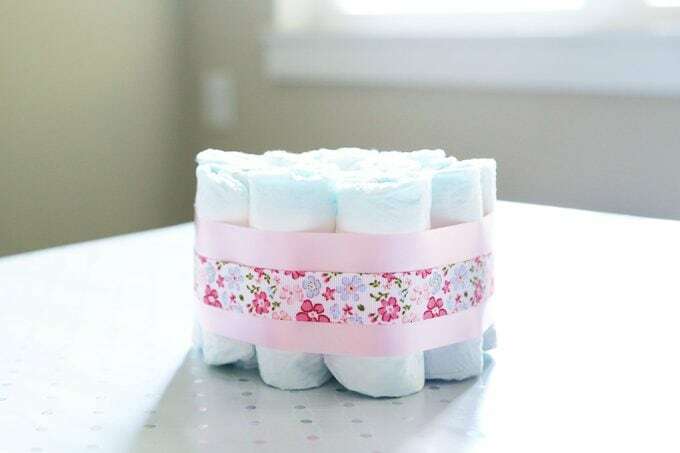 A few years ago I made some super simple diaper cake centerpieces for a friend’s baby shower and posted about them here. I loved them so much that when we were planning a baby shower for my sister Brittany, who is having her first baby (a girl! ), I decided to go with diaper cake centerpieces again, albeit a little more elaborate this time. I’ve decorated for many, many parties in the past and while I love making decorations, it always seems like such a shame that they all just get thrown away at the end of the day. 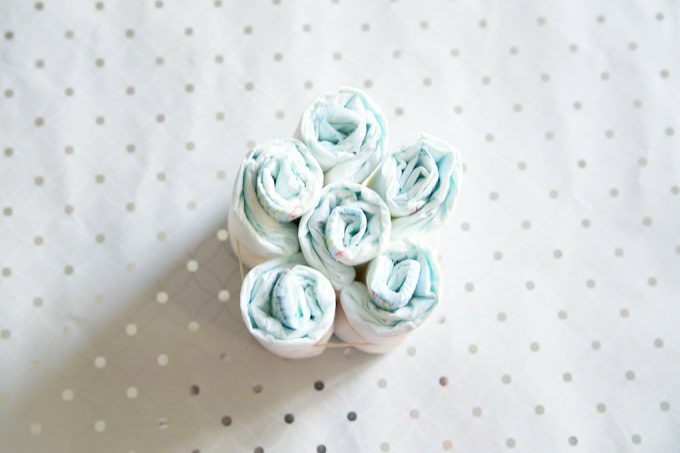 The diaper cakes solve this problem because not only are they cute, but they can be disassembled and used for baby when she arrives– win-win! 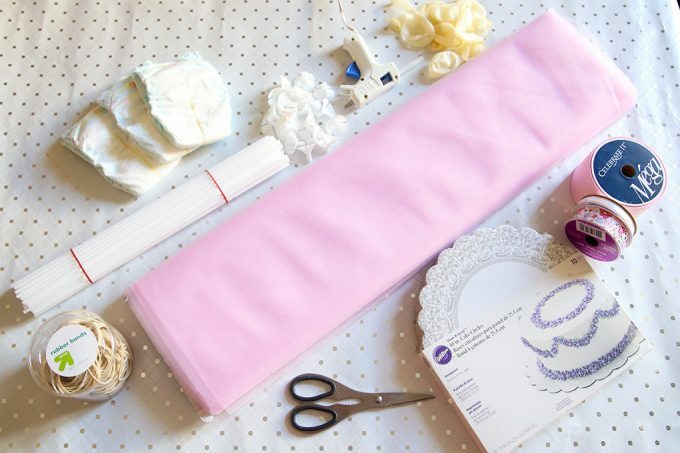 Bolt of tulle– You’ll need one yard per diaper cake. 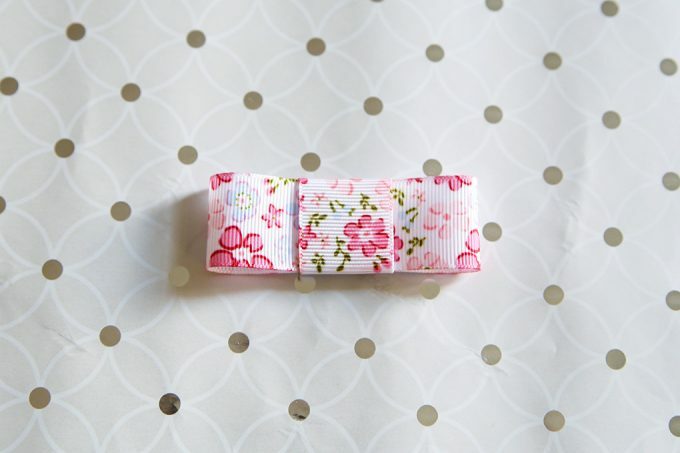 Ribbon- I used pink 2.5″ satin ribbon (I bought the mega 75 yard one at Michael’s and it was way more than enough! 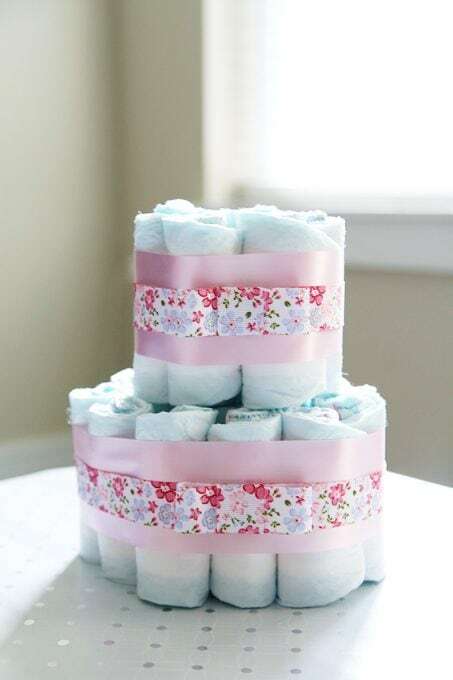 ), a floral patterned 1″ grosgrain ribbon (found at Michael’s, I ended up using 6 rolls for 10 double decker cakes + 10 single layer cakes), and 1/4″ white satin ribbon (about two feet per diaper cake). This is a great job for when you’re sitting in front of the TV and vegging out. 🙂 I rolled over 300 diapers to make all of the cakes we needed, so it took a good chunk of time! I simply started at the top of the diaper and rolled it around itself, securing each one with a rubber band. 2. Build the first layer. After I had rolled all of my diapers, I started assembling the layers of the “cake.” Since the bottom layer was going to be fairly large, I made the center of that layer first, putting one rolled diaper in the middle and positioning five more diapers around it, securing everything with a rubber band. 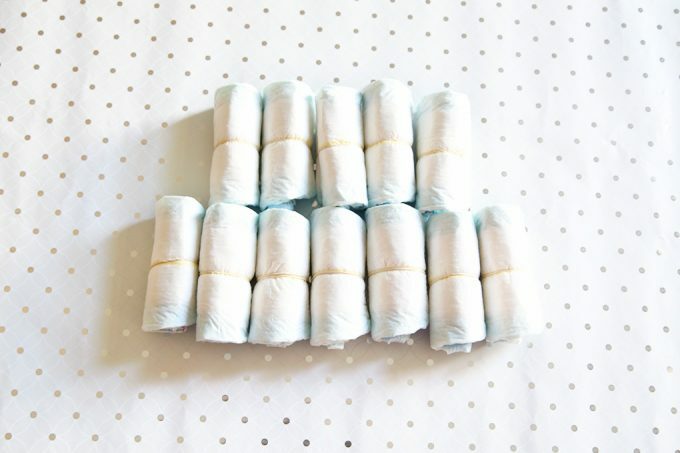 I then took 10 more diapers and arranged them around the center section that I had just created, again securing everything with a rubber band. So in total, the bottom layer of my diaper cake had 16 diapers. 3. Build the second layer. I then constructed the second layer of the diaper cake, putting one diaper in the middle and surrounding it with six more diapers for a total of seven. Now that I had my “cakes” created, it was time to make them pretty! 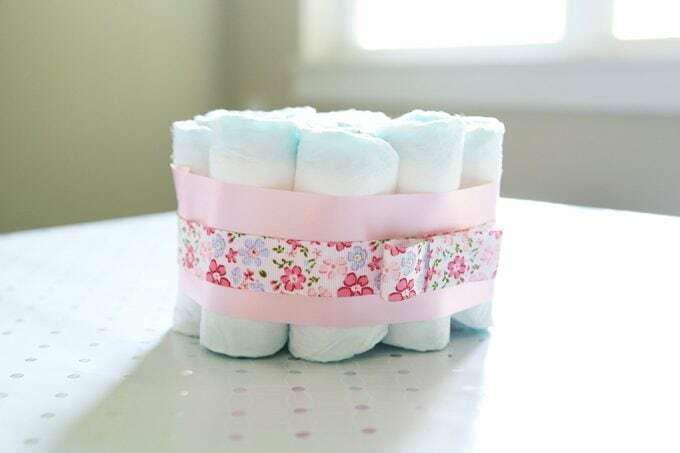 I first took my 2.5″ wide satin ribbon and wrapped it around the base layer of diapers, securing the ribbon to itself in the back with some hot glue. For some extra interest, I added a second layer of ribbon– 1″ floral grosgrain– securing it to itself in the back with a dot of hot glue. I also used a dab of hot glue to attach the grosgrain ribbon to the satin ribbon in both the front and back of the cake. The diaper cake was still looking sort of plain to me, so I decided to add a bow, which I made out of the 1″ grosgrain ribbon. To make the bow, I cut a 7″ piece of ribbon and used a dot of hot glue to make it into a loop. I then took a 2.5″ piece of ribbon and wrapped it around the center of the loop, securing it with some hot glue in the back. 6. Repeat with the second layer. I then repeated steps 4 and 5 with the second layer of the diaper cake, adding the wide ribbon, then the more narrow ribbon, then the bow. 7. Top with a tulle-wrapped balloon. I could have just left the diaper cake like that, but I have been just slightly excited about using all the pink since this is the first girl baby on my side of the family! I knew I wanted to add a final touch. I blew up a clear balloon and attached it to the balloon stick + cup. Then I cut one yard of pink tulle from the bolt, leaving it folded in half as it comes on the bolt. I wrapped the tulle around the balloon on the stick and used a thin white ribbon to secure it. Then I just had to slide the stick down the center of the diaper cake. A few tips: Because I wanted the tulle-wrapped balloon to sit right above the top of the diapers, I ended up cutting about 2″ off the stick to make it the correct height. If the bottom part of the tulle looked messy after I had tied it around the balloon, I would simply use scissors to clean up any uneven parts. I stuck each diaper cake on a pretty cake circle, and it was good to go! I knew I needed 20 cakes for our large-ish baby shower, so I made 10 of them with two layers like I showed above, and 10 with just the first layer. 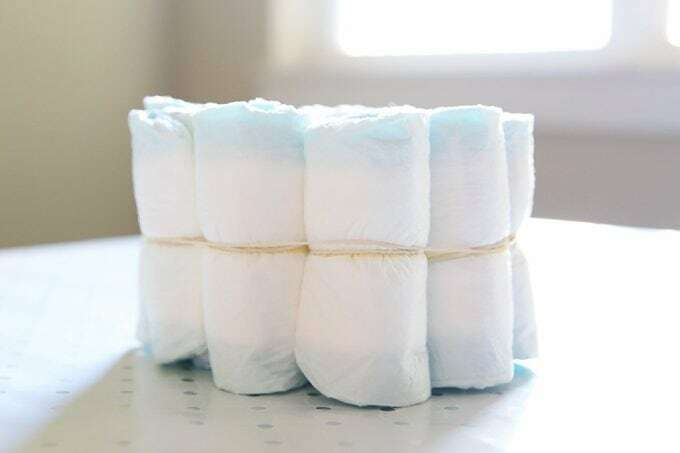 When I made the single layer diaper cakes, I would cut the balloon stick shorter as well. It ended up looking cool at the baby shower venue with the varying height of the balloons. They were a hit! 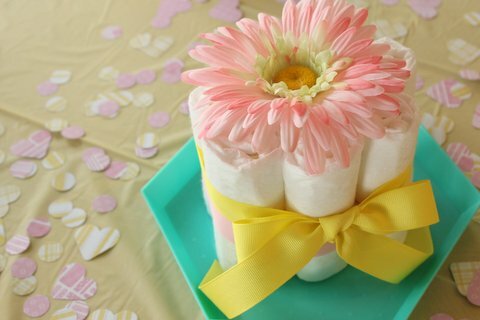 Diaper cakes are awesome because they are easy to make and they are useful to the mama-to-be once the shower is over. 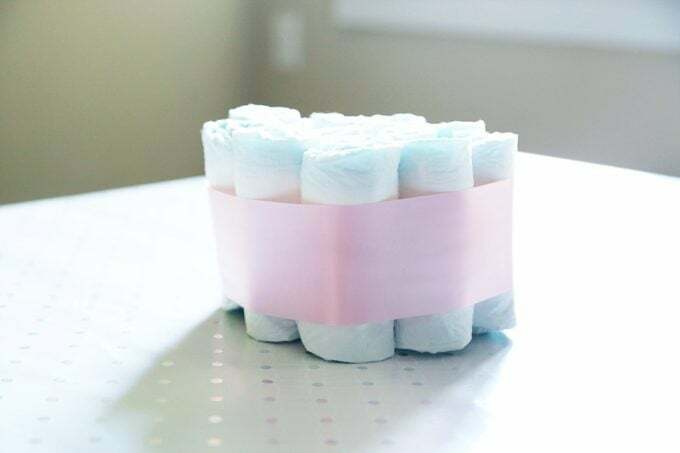 If you’re looking for an even easier version than the ones I shared above, you can see my sweet and simple diaper cake baby shower centerpieces in this post. Thanks so much, Katie! SO true! They grow too fast! 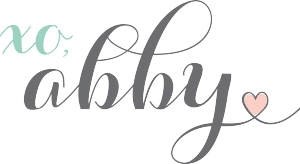 Abby, I love you’re blog and you inspired me to make my own blog and now I’m just trying to think of content and things to do for it. Aw, yay! Good luck on your blogging adventure, Victoria! Super cute centerpiece Abby. 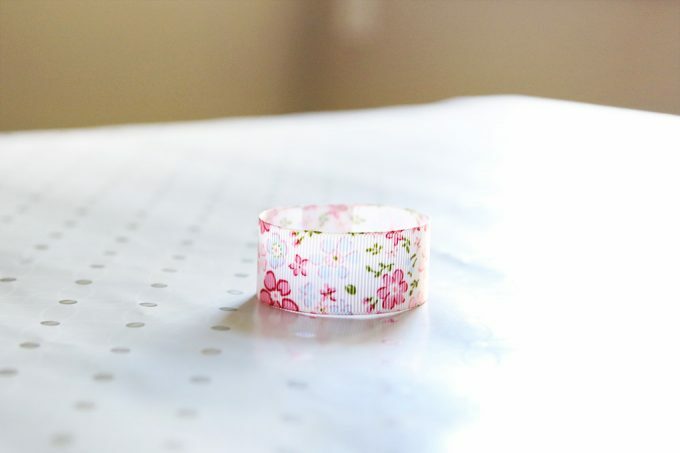 I like the added touch of the flowered ribbon, makes it super girly without being too pink! 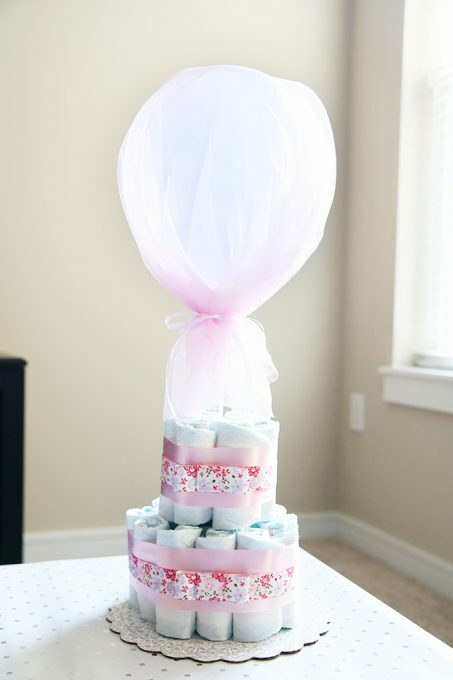 What a great idea to make it a two layer diaper cake with the tulle balloon for height. Not to mention the centerpiece is also a great gift for a new Mom! Thanks so much, Addi! I loved how they turned out and my sister was definitely grateful for all those diapers! 🙂 Have a great weekend! I love these! 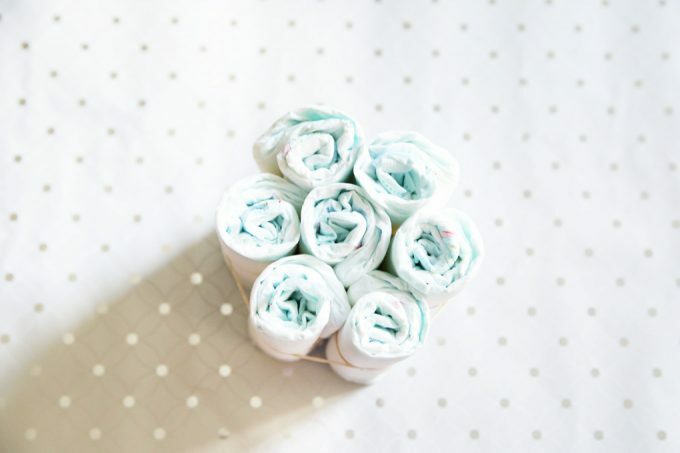 What a pretty and useful decor item for a baby shower! I think so too! 🙂 Thanks and have a great weekend!